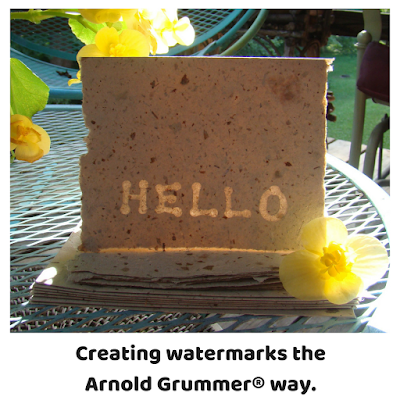 create white slurry and create one or more sheets of med/heavy weight handmade paper. 3. Iron the dry paper to achieve a smoother surface. 5. 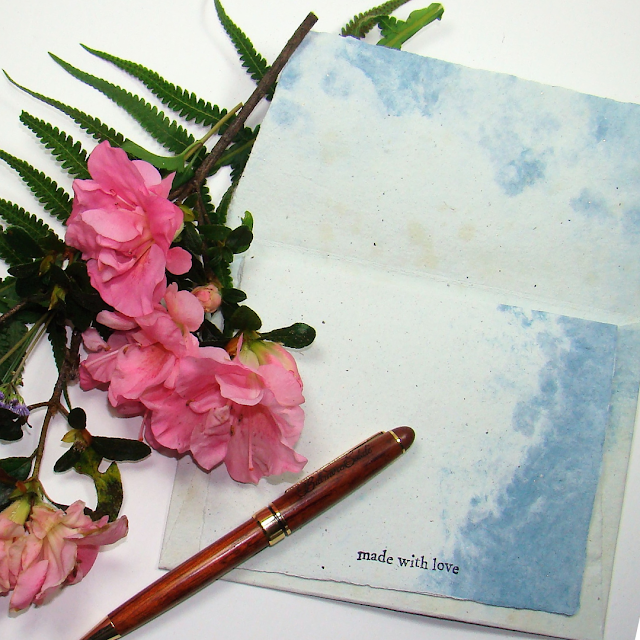 Use the stamps and black ink pad to create a pleasing floral design on the torn paper. 6. Stamp the verbiage and the bees. NOTE: You will work quickly on one leaf or one flower at a time. 7. Start with the lightest ink color and fill in the whole petal. 8. While the ink is still wet, apply the next shade of ink covering less of the shape. 9. Blend the edges where the two colors meet with the lighter shade of ink pen. 10. While that ink is still wet, apply the next darkest shade of ink covering less of the shape. 11. Repeat blending with the 2nd color. 12. While the ink is still wet apply the darkest shade under where another leaf or petal overlaps. 13. Bled where the colors meet with the lighter shade of pen. 15. Place it on a small easel to display. NOTE: Be sure to follow the links to the rest of the AG DT members blog hop. Delighted that you like the canvas, Sandee. What a beautiful card! I love the colors and design. Thanks a bunch! The Marvy La Plume markers and the Stampendous stamp did all the work...smile. Beautiful coloring on the flowers! Thanks Amy. With all the La Plume marker colors to choose from and the wonderful stamp from Stampendous....it was easy. Very pretty piece of art! Thanks Jeanne......everything looks better on handmade paper...smile. 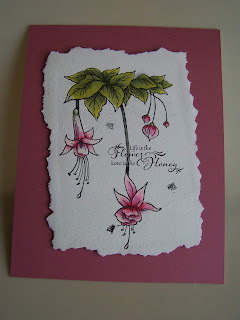 Your beautiful card reminds me that spring is on it's way! Delighted that you liked the canvas. Spring is indeed on it's way...smile. Thanks Bunny....just had to add the bees...smile. Your friend will be thrilled with your card. it by completely by hand. True friendship. She loved the canvas and it is perfect in her sunroom! The most precious gifts I have ever received have been made by hand with love. I keep all of the handmade cards I receive. (or I can use them to make paper). I care enough to treasure it. Thanks Steph. The canvas was a great hit with my friend. Thanks for your kind words. The canvas is really lovely. Thanks Terrie. The canvas is even more beautiful in person. I never thought to iron the paper. Great tip. Ironing the handmade paper really does help make it more smooth...smile. Beautiful card - the hand made paper adds so much ! Thanks for sharing ! Handmade paper makes everything better...smile. I did frame the canvas before I gave it to her. 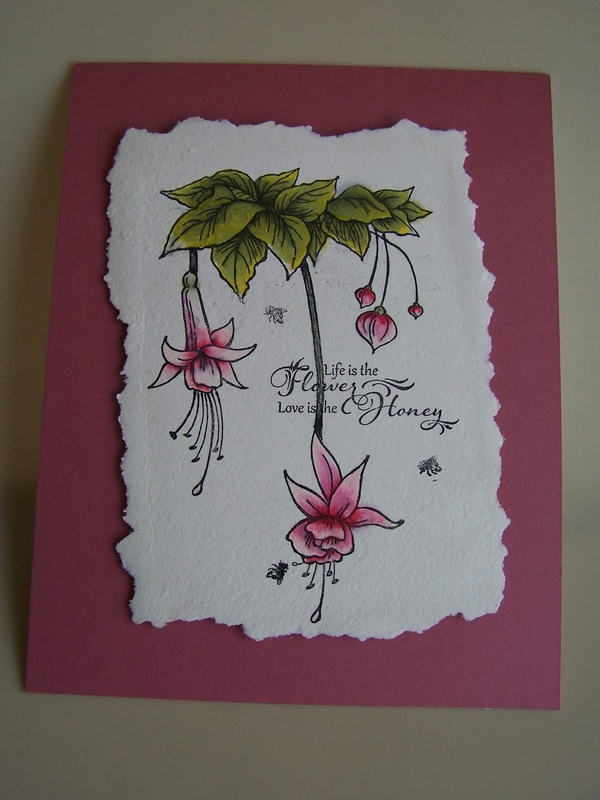 The organic texture of your hand-made paper goes so well with the botanical image!! Super-pretty!! Thanks Janis. My favorite surface to create art on is handmade paper. I usually spen a whole day making paper so that I have a stash to pick from. April 15th is special to me so I am going to pretend that this card is for me, since I like it so much. Happy April 15th Teresa! Glad you liked the canvas. Thanks Nancy. Will have to work on getting the stamp set for you...smile. You have created a beautiful card with a bright idea! Love the handmade paper detail! Greetings! Another Michele with one "L"...smile. Delighted that you like the canvas and handmade paper. Very pretty. Perfect for a gardening friend. Thanks Sue! She was so surprised. Thanks Sharon. I found a photo in a gardening catalog to refer to....there are so many colors of La Plume markers to choose from.....picking the correct colors was easy. Love the look of your handmade paper! Thanks a bunch! Handmade paper makes everything better! Your fuschia flowers look enchanting! I bet even the hummingbirds would think they are real! Absolutely beautiful card! Happy Earth Day! Thanks Lori.....I bet they would too...smile.